We've been a little quiet here at the Talent Metrics blog. As a boutique consulting firm we've been more focused on delivering to clients over the past few months. I had promised myself that I'd write about my experience with I-O Shaken and Stirred (I plan to write about the experience and provide a Joel Lefkowitz reading list that I had promised to Beth Melilo.). However, teaching, consulting, and life have gotten in the way. After #SIOP18 and the I-O Shaken and Stirred experience I was awestruck by the level of engagement in the #IOPsych community. I was able to receive feedback from many of you regarding my talk about values in I-O Psychology. We ran a caption contest based on a fantastic picture that Ben Hawkes took of one of my furtive glances. Lisa Kath won the caption contest but I couldn't believe how much engagement that one tweet received. It left me with an indelible sense of the intelligence and power of the #IOPsych community. 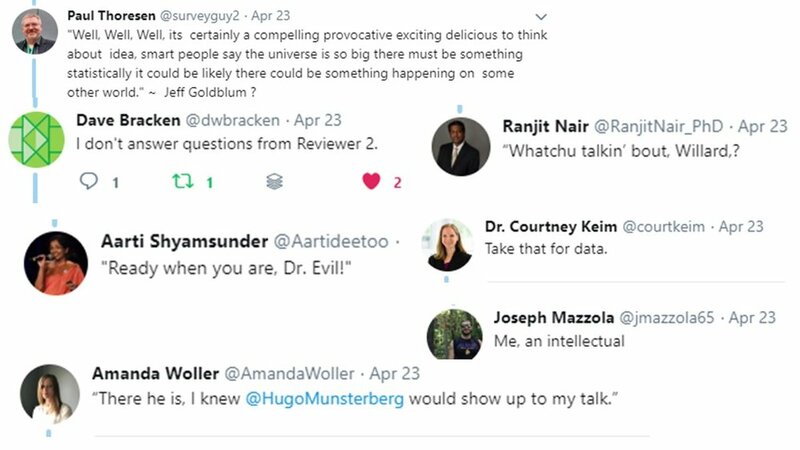 At the very least I realized that the IO psych tweeps appreciate making jokes about my nervous glances. Since there's no end to oddball pictures of the Talent Metrics team, we've got a few more caption contests coming up! My S&S talk was about the dream of Wakanda and why it had struck such a chord with the general audience beyond Marvel movie fans. But it was also about building the science that we wished for in the future and in turn offering a vision of the world of work to people outside of our community. Each of the S&S talks highlighted a different element of I-O psychology's values whether it was the need for open access science, civility in the workplace, utilizing neurodiverse talent, valuing the feminine, or becoming an I-O entrepreneur . Each of these speakers spoke about what they cared about. I would recommend checking out the Shaken and Stirred YouTube Channel to see the level of innovation and intelligence on display in each of the S&S talks. But if we're serious about the dream of an #IOpsych Wakanda it can't just be S&S speakers that express the values in their hearts. We need all of you to participate. Which brings me to the beauty of Talya Bauer's Presidential call to action She gave some clear action steps about how to get involved in SIOP the organization. I want to support those remarks and ask each of you to take your IO Advocacy (#IOadvocacy anyone?) and bring your whole selves to SIOP whether its through submitting a poster, a panel, an IGNITE session, or an alternative session. Try to submit something this year that you truly care about. Maybe it isn't something that you think will be a slam dunk to get accepted but something that's true to who you are. Submissions aren't the only way to affect SIOP. You can express your I-O Psych values as a SIOP reviewer. The conference has grown enormously and its important for all of us to not only submit but to review and participate in the content curation of our conference. Beyond the conference, there are many activities that we wish SIOP could take on. If you want SIOP to take on a project or see an opportunity for SIOP in an area that you're passionate about, join the organization, volunteer on a committee or just advocate for the science. Finally, I ask everyone to participate beyond SIOP. Whether that's by participating in other conferences (APS, APA, AOM) or bringing some new initiative to your workplace that's rooted in the science of I-O Psychology, or even talking about I-O psychology with a new audience (i.e. a high school class). You can even get involved in a Global Organization for Humanitarian Work Psychology project It's up to us to express our pride for our field. By advocating for what we believe in I-O Psychology we can get true workplace science out into the world. If I can get my IO tweeps to create such funny, amusing jokes based on 1 silly photo then I hope I can encourage you to represent #TeamSIOP in a new setting where you can advocate for a Smarter Workplace. Let's build the community we dream of starting with SIOP but not stopping there. With only a few days left before the SIOP submission deadline, there's no better time than now to get involved. Good luck with your submissions, your reviews, and your advocacy!